Iran's Supreme Leader says missiles will be a part of Iran’s future relations with the outside world. Missiles, and not negotiations, will be a part of Iran’s future relations with the outside world, the country’s Supreme Leader Ayatollah Ali Khamenei declared on Wednesday, according to The Telegraph. The comments are an apparent rebuke to Akbar Hashemi Rafsanjani, a former president who has become a close ally of current President Hassan Rouhani, and who said last week the “future is in dialogue, not missiles”. "People say that tomorrow's world is a world of negotiations and not a world of missiles,” said Khamenei on Wednesday, adding, “If they say this thoughtlessly, it shows that they are thoughtless. However, if this is intentional, then this is treachery." The comments come following Iran’s recent ballistic missile tests, in defiance of a UN resolution that endorsed last year's nuclear deal with the West. Those tests followed several similar tests in October, which a team of UN sanctions monitors later confirmed had violated of a UN Security Council resolution. On Tuesday, Western powers sent a letter to the UN Security Council and to UN Secretary-General Ban Ki-moon, demanding that actions be taken over Iran’s repeated ballistic missile tests. During an earlier speech to mark the Persian New Year, noted The Telegraph, Ayatollah Khamenei voiced his pride in the “Iranian talent that can strike a target with a missile from a 2,000-kilometre distance with an error margin of just several meters”. He admitted that the nuclear deal had crossed some of his “red lines” and argued that the whole concept of negotiating with America was flawed. “If we step back in the face of the U.S., the enemy will move forward step by step and we will reach a point where the Islamic Republic of Iran will be devoid of content and only its appearance will survive,” warned Khamenei at the time. 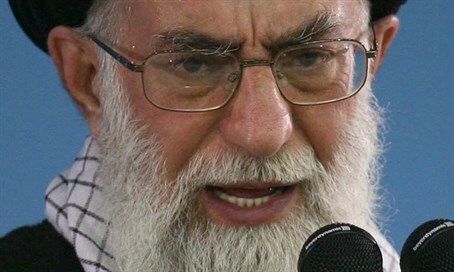 Khamenei has repeatedly verbally attacked the United States and warned Iranians not to trust Americans.